This indicator shows the levels and signal dots of the Doji pattern. 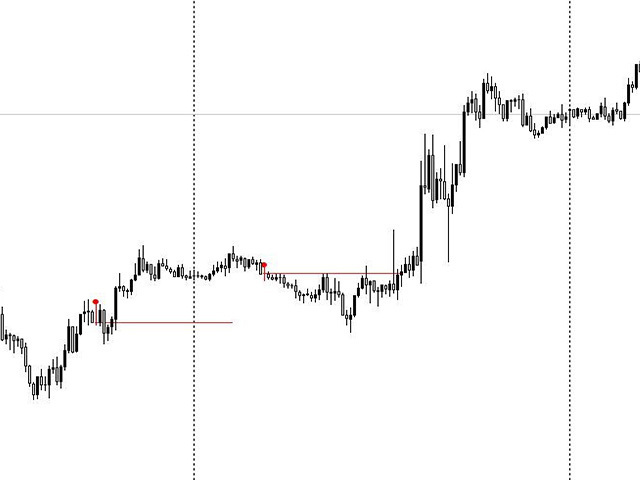 The indicator allows traders to easily determine possible location of a price rebound. Doji is a candlestick with Open and Close price equal, or almost equal. Doji denotes the balance between buyers and sellers, or the absence of major players, or level testing. This pattern can mean both a reversal and a continuation of the trend. Icon code - character code, default: 159. Indent - indent from the candlestick or bar, default: 10. Style line - enable levels and set their type, default: Ray. Color level - color of levels or segments, default: Red. Width level - level width, default: 1. Style level - level style, default: Solid. Length ray - segment length, default: 35. Bars - the number of candlesticks to display the levels in history, default: 1500. Note: the indicator is suitable both for trading on М1, М5, М15, М30, and on the higher timeframes.